I learned to make jewelry by the seat of my pants. They weren't very attractive pants, either, because I made soooo many mistakes along the way. I could have saved a lot of time and money and effort if I'd only invested in a class or a BOOK for Pete's sake, but no, I just happily jumped in with both feet and the Ugly Pants and took off. I still don't take a lot of classes, but when I do, it's always a class in something completely different from my normal style of jewelry design. I also try to take a class that utilizes tools and materials I'm either afraid of or at the very minimum don't have a close relationship with. Otherwise, I think, what's the point? 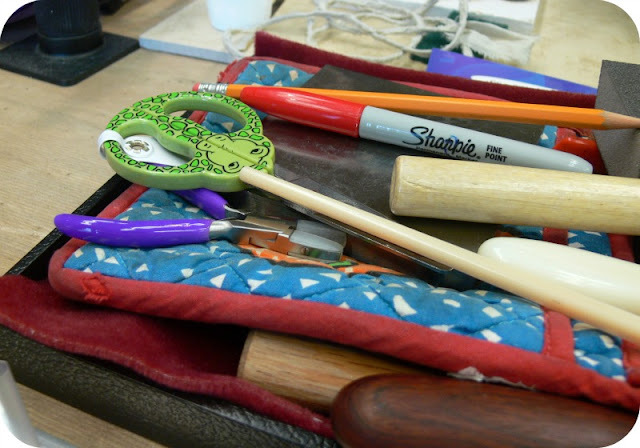 So, armed with the requisite Starbucks Mocha, a stack of CDs, and a tote bag full of beading tools, I headed to Northern Virginia to take a class via ArtBliss with Stephanie Lee. The goal -- to learn how to make a bezel using solder, brass, and nickle. 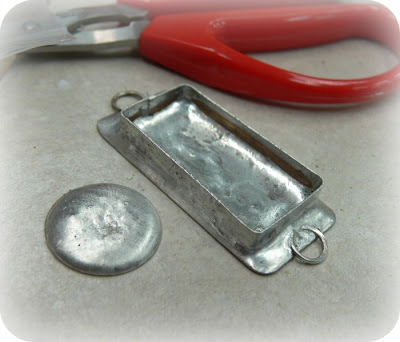 Not the traditional metalsmithing way, which I've also done, but what Stephanie calls Homesteader's Metalsmithing. All of the materials are accessible, most from Lowes, and using a simple butane torch, off we went. Well, off MOST of us went. I had a few Ugly Pants moments. I'd flux the metal, heat the metal, burn off the flux, and toast the metal to a crisp. Bad. No solder would stick, so flux again. Then I'd start small little fires on the fire brick (don't ask me how that happened). Then I'd heat the metal to where the solder would flow -- forgot to flipping flux it, so the solder flowed right off and wouldn't stick. Now don't get me wrong. It needs work. And it's not perfect. But I DID it. 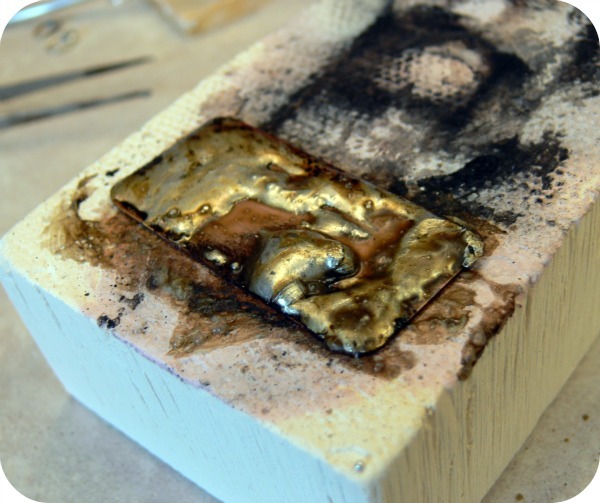 I kept at it, making another bezel, this time leaving the sides in brass with the rest in silver, and another very cool design that was a HUGE "ah-ha!" Moment of Happy for me. Innovative ideas rarely come to me -- I'm more of a "follow the pretty bouncing bead" sort of person, so when I soldered a huge rectangular Bali bead to a square of copper with the idea of creating a talisman-like tassel necklace, I was kind of stoked. But that piece was away for Picture Day, so stay tuned. Of course, half the fun of taking a class is meeting people. I got to sit across from Sandi Volpe, one of the sweetest people I've ever met. We met once before when I was doing a craft show, but this time, I really got the chance to chat and get to know her. Somehow, she, too, was away on Picture Day, but her tools weren't. I also enjoyed meeting people whose names I never got (we were so excited and wrapped up in what we were doing!) but there was a lot of complimenting of jewelry (and aprons -- one girl had on the CUTEST apron) and sharing of what I fondly call "stuff" to fill bezels with. My watch components were a hit. I've had that box forever and used exactly three gears out of it. Time to share! I also got to meet Erin Prais-Hintz, who WAS present on Picture Day, along with Cindy. Heavens to Maude but I hate having my photo taken. And I don't often win anything, but I did at the class! 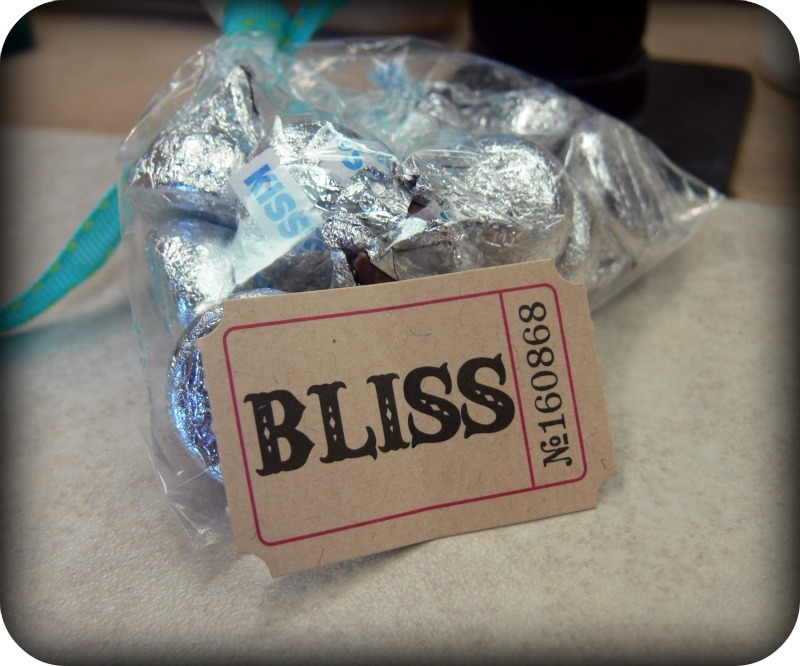 If my ticket unfolded to read, "BLISS", I won a prize -- in this case, a set of bezels for resin. The day ended with meeting up with Jeanette Ryan and Tracy Statler and having dinner with my table-mates, Stephanie Lee, and her husband. Yes, I got pie. No, it was not delish. Sigh. I'm sure if pie mailed well, one of you would send me one but alas. I remain in search of the perfect slice o' pie. So what did I learn? Every time I take a class -- and I mean EVERY time -- I'm the newbie. I'm the one that messes up, doesn't completely finish, usually sets something on fire, and gets knots in her stomach. But I'm also very, VERY glad I took the class, and get far more out of it than being able to hang up the Ugly Pants for another day. :: Sharing the joy of class successes. :: Allowing myself to mess up. :: Understanding it's ok to be a newbie after eight years. :: Realizing that all pie is not created equal. 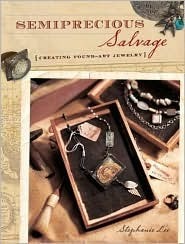 If you can't take a class in-person with Stephanie Lee, consider one of her e-courses, and don't miss her book, Semiprecious Salvage. Lori, that looks like so much fun! I have taken one metal smithing class but only made one piece. I am itching to find an easier, less time intensive process. Maybe I'll check it out! Thanks for sharing. Lori, What fun would taking a class and not making mistakes be? After all, isn't that how we really learn? Your day does sound anxiety-laden, but more than that, it sounds like you had a *lot* of fun!! Lucky you to take Stephanie's class in person. I have the book AND took her e-course, and most of my stuff looks just like yours (the messed up ones, not the nice one). I'm the kind of person that works better in a classroom setting, but that isn't feasable right now. What a fun time for you!!! 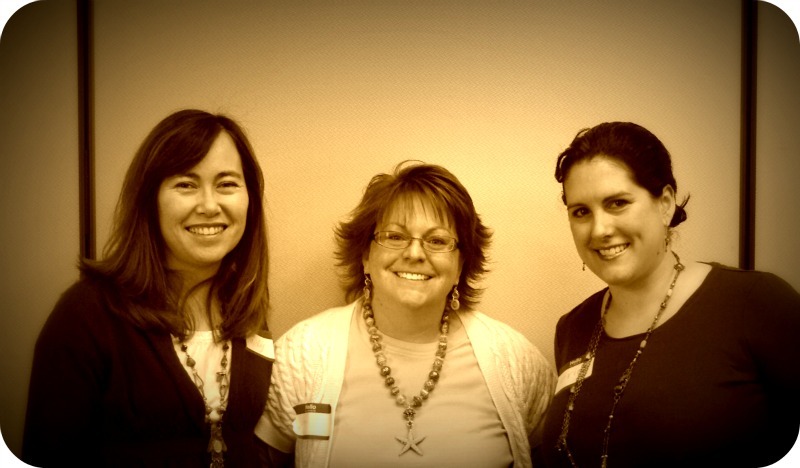 I'm so jealous that you got to meet Cindy and Erin in person!!! I SO wish I could have taken this class with you guys! And I would have been right there with you, making loads of mistakes...but that's half the fun, right?! Oh I so wish I could have been there to be with all of you! It sounds like you had a great time not only learning but enjoying each other! Lori, it sounds like you had fun, anxiety and all. Like Holly said, what fun is taking a class without making mistakes. You perservered and have awesome pieces to show for it! 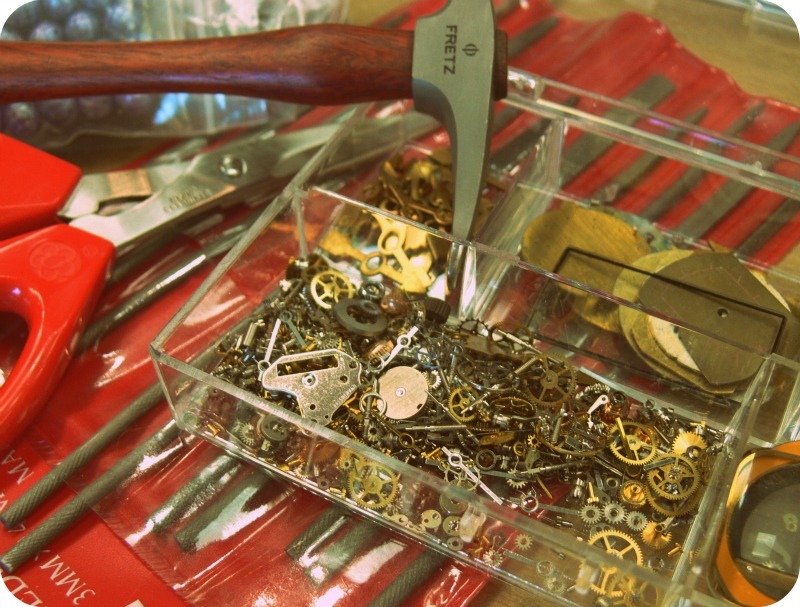 I so wish I could have taken the class with you all because it sounded like so much fun - really like the box of watch gears. LOVE your bezel. Thats really good. They are NO easy task for sure. I surely want to take some fun classes in the future. You look like you had loads of fun, a fabulous day! Thanks for sharing your class! I sure wish there were more classes here on Vancouver Island. Thanks again for a great post Lori! You crack me up with your writing, I feel like I'm sitting right beside you snickering at you lighting the brick on fire. LOL. Well done! When will YOU teach classes?? I took Stephanie's ecourse and it was wonderful! She is an amazing teacher. Her book is fantastic, too! Glad you enjoyed your class with her! How much fun is that, to take a class and learn a new skill, and be with friends? And I love the pic of ya'll, especially since you and I currently have the same hairdo! So funny that you think your pieces need a lot of work, cause all I could think was, "How cool!" I'd be one of those who take a class in stuff they are already sort of confident with- and you are right, what's the point? Thanks for sharing your (almost!) fails as well, there is too much perfection going on in blogland. The closest I've ever come to "playing with fire" is a PMC class. You should be really proud of yourself. You done good, girl! How funny, I've set fire brick on fire as well...and no, I have no idea how it happened! :) Glad to see you had fun in your class! Sounds like you had a ton of fun! And if pie mailed well, I would totally send you my friend's pie. He's like a 20's housewife in disguise. Sounds like you had tons of fun! And there was pie! Even better :D I keep trying to teach myself stuff instead of taking classes, but I realised that wasn't going to work with lampworking. I could've set the house on fire or something. But I'm considering taking the plunge and parting with cash and going on a silver smithing course. I don't think I can teach myself that, else I'd feel bad about the amount of silver I got through, and no pretty things to finished with! Lori, you are too funny! Loved reading your post about our class, didn't we have fun? I wish I could say I set something on fire, that would be cool (as long as it wasn't me or anything important, of course.) Hope to see you again some day soon! Wow. I know I want to learn metal smithing, but like you I didn't want to take a class I thought I might not be good at that used tools I am a little intimidated to use. I took a class in making glass beads using a torch. When the class was finished and I went home, I was so scared of burning down the house (or melting the new carpet in the basement) that I couldn't find a good place to set up. I guess I let that experience intimidate me. When at first you don't succeed, don't stop trying different classes. Thank you for your courage and your very colorful posting. Your bezel turned out well. I have to tell you though, I laughed when you told about starting small fires on the fire brick. Enjoy perfecting your new skills. I can't wait for picture day. Stephanie is a one-of-a-kind teacher, and I just love her =) She is one of my (American) idols! I can see you mastered your flooded bezel...very, very nice! I haven't been following your blog for very long, but have enjoyed every single post since I found it. So many of your posts just crack me up (too funny!) - and I can SO empathise with what happens to you in classes. I'm also invariably the one who's all thumbs whenever I take a class. Thank you for sharing - it made me feel loads better :-). And thanks also for inspiring me to try taking classes that are out of my comfort zone. Good gracious, heavens to mercy. . .that looks like a lot of fun. Newbie or not, your bezel is so VERY COOL!! I'd love to take a class like that, but hardly anything is ever offered remotely near where I live in the deep south. Of well, vicarious is it! I have taken Stephanie's class on line and it was AWESOME! I would highly recommend it to anyone who can't get to her in person. Your piece turned out great and they get easier every time you make one. OMG Lori, I am absolutely the same way! I'm an INTJ and I totally have to process things alone. I'm ususally the one left behind asking questions, sneaking peak at everyone else! too funny. Maybe next time you should call me then you won't be alone! Looks like you had fun! Fun! I would like to meet Stephanie in person for a live class. I took her e-course, but bought the DVDs. So, when I have some quality downtime I can really practice the techniques. I know, stop procrastinating! I just frown on the struggle part when I'm learning the foundation techniques - especially metalsmithing. I'd much rather be doing the happy designing part with the trial and error experiences behind me. I think your results are great Lori. Nice pics! Huge congrats and a yay for learning new things! Wow that looks like so much fun! I love the bezels...and I love your watch component collection! I don't take a lot of classes either. So, I too make a lot of mistakes. I'm inspired to take up a class since it does look like a blast! I know I learn more from my mistakes than from the processes that go smoothly. You did have me puzzled: I wondered what the heck do ugly pants have to do with jewellery class. I imagined these must be your work pants or something and I scrolled down the post to see if you posted a picture of them. Went through the entire post, no ugly pants. That was yesterday and I was tired so I went to bed thinking I'll deal with this tomorrow. So today I reread your post and figured there must be something hidden in the term 'by the seat of the pants' as a non native speaker I'm pretty good at spotting these but it escaped me yesterday. Suddenly everything made sense and now I get the ugly pants analogy. 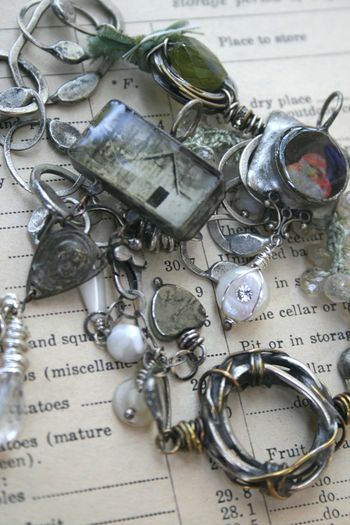 I love how brave you are in venturing into new territories with your jewellery making. And not being afraid of making mistakes or being the newbie in the group. Hi, the class sounded great. I really need to get out a bit and do a class. I'm still learning about beads and making jewellery, so I tell myself baby steps. You all inspire me though. Oh Lori, that sounds like so much fun. Wish I've been there. And the pic of you three is so cute!!! I guess I have to practise with my Stephanie Lee book on the weekend. You make me chuckle, and that is great! You take everything in stride, persevere, and that is how it should be! Your work is wonderful! Hey, I'm so glad you had fun and you did a fantastic job, from what I see! You always make me smile:-) Must do a bead in one of theses days or a bead marathon where we make and chat. Okay, first - you three are SUPER adorable! Color me jealous! Second, you aren't the only one who has set your station on fire. I took Metalsmithing in college and I flat-out wasn't good at it. I broke every single saw blade (I used up the entire class's supply actually), stabbed myself a lot, cut myself twice, lit my shoe on fire, had pieces of metal fly off and at my face during the polishing process, and basically couldn't be trusted to work alone. The professor moved the first aid kit right next to me to save me the trouble of walking across the room - THAT'S how bad I was. I didn't really improve, but the one area where I excelled was with setting the stones. Go figure, right? I absolutely loved this class. I think that all the metalsmithing that I have had up to this point was just laying the foundation. I get it now. It clicks. And I really hope that I can get something set up and going before all this great info flies out of my head! I really want to do this... I am motivated! I love that you showed how ugly it can be to get to the beautiful. Brutto bello... or ugly beautiful as it were. I can't wait to see what you do with it. I am wearing mine today and will hopefully get a picture soon. But the best part (and I do wish that we had gotten to know all the participants and done a quick photo shoot of our pieces!) was that I got to make new friends (like Sandi and Melissa) and solidify the friendships that I already had going (with you and Cindy). This was the best decision and the experience was priceless! Thanks for the memories, Lori! This is such a cool idea! I have been contemplating taking some classes to make my own bezels and your post really motivates me to get them scheduled! The bezels look beautiful! Great job! Sounds like you had a great time dispite the troubled beginning. Wish I could have made it...maybe next time. can't wait to see your finished project. I took the same class in Houston at Adorn Me 2011 a couple of weeks ago. I related to your whole experience. My third one finally looked okay. Yours look fantastic. Stephanie's book is awesome. I've had it for over a year and I keep going back to it all the time. There's so many things you can learn from it. I'm jealous and am whining just a little bit because you got to take her class! Thank you for your honesty. Learning is fun! I love that book and reviewed it for Amazon!